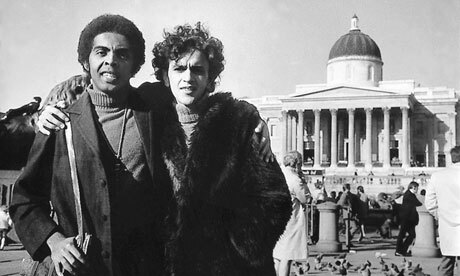 Gilberto Gil and Caetano Veloso in Trafalgar Square, London, 1969. I’ve noticed a lot of people being directed to this site looking for “Expresso 2222.” The song is the title track for Gilberto Gil‘s 1972 LP ( No. 26 on Rolling Stone Magazine’s ranking of the 100 best Brazilian albums of all time), which includes a number of songs that Gil wrote while in exile in London during the most repressive years of Brazil’s military regime. Gil says the first verse of the song — in Portuguese, “Começou a circular o Expresso 2222/Que parte direto de Bonsucesso pra depois” — came to him one day in London; he wrote it in a notebook, but the last part – “to the hereafter” – gave him a block and he couldn’t write any more. He decided to let the verse sit, “like wine in a barrel, to age.” Nearly a year later he re-opened the notebook, which he had also used for messages and notes to his wife, and picked up where he’d left off, quickly finishing the lyrics and putting the words to music. Gil explains that his childhood and adolescence were marked by train travel, “one of the most fundamental modes of transportation for us in Bahia.” The Leste Brasileiro trains that ran into and out of the central stations in Ituaçu, Nazaré das Farinhas, and Salvador – the towns in Bahia, Brazil, where Gil grew up – had made a lasting impression on him, and for some reason the image of a train with the number 222 stuck in his head; he says it was the first image that came to mind when he began writing the song. 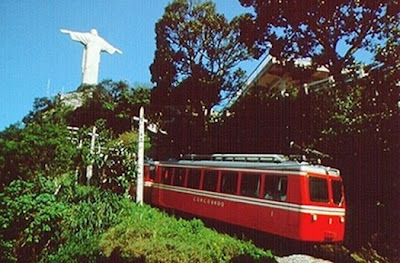 The train to Christ the Redeemer on Mt. Corcovado, Rio de Janeiro. Thank you. I discovered this song only a few weeks ago, and in fact – I discovered Gilberto Gil like this. He is scheduled to perform in my town in a month or so – I am so lucky! Brazilian music is new to me, as in two years in Latin America I did not spend any time in Brazil. I’ve submerged myself in Colombian and Argentinian culture, but only now (happily) I am discovering Brazil. Thanks for your comment, Alon!